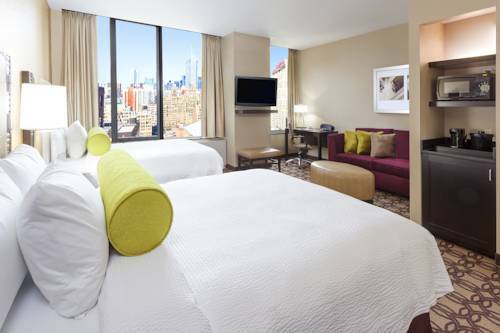 The Fairfield Inn and Suites New York Midtown Manhattan hotel offers guests a true Big Apple experience from a convenient location near Penn Station and Madison Square Garden. Travelers looking for midtown hotels in NYC will enjoy the free daily breakfast buffet, free WiFi, spacious accommodations, as well as easy access to attractions such as the Empire State Building, Herald Square, Macys, The Javits Center, the High Line Park, and Times Square. Guests at our Penn Station hotel will enjoy our spacious rooms and suites, plush Marriott bedding, in-suite amenities, and south-facing views of the New York skyline. Visitors who are in town for business will love the location of our hotel. It offers a walking distance to various companies and conference venues. Features include a chic roof top bar looking over Madison Square Garden, the 24-hour fitness center, and a 24-hour business center. Book now to receive the best deals and offers! Roof top lounge with panoramic views of Manhattan and the Hudson River serving light fare and drinks.